Christmas is a time for reflection and a time to look forward and neither offers any merriment for Aston Villa. Ten points away from safety as things stand, they can look to no precedent in the Premier League era (the ‘monied’ era, since 1992) for a club with single-digit points at Christmas avoiding the drop. There have been three ‘Great Escapes’ in that monied era, by clubs who were bottom at Christmas and survived. But all three – West Brom in 2004, Sunderland in 2013 and Leicester last year – had 10 points by Christmas before making their remarkable recoveries. Villa have seven, and are, on statistical history, doomed. One way that we might consider the wider posse of contenders for relegation is to look at the 20 completed seasons of the Premier League that have featured 20 teams, from the 1995-96 season onwards, when the top division was slimmed down. With three teams relegated each season, there have been 60 relegations in that period. I can tell you that 59 of those 60 relegated teams had fewer than 21 points after 17 games (the number each team has played so far this season). The exceptional team with more than 20 points after 17 games that went down anyway was Blackpool in 2010-11, when they had 25 points after 17 games and went down with 39 points from 38 games. If we accept that fewer than 21 points so far will demarcate the relegation contenders then there are eight: West Brom, Bournemouth, Chelsea, Norwich, Newcastle, Swansea, Sunderland and Villa. If we focus not on 17 games specifically but on the table on Christmas Day – regardless of the number of games played each season by that date – then we’ll see how clubs often rise out of the bottom three on that day to survive, and also fall from higher to get relegated. Our first graphic today shows the top three and bottom three on Christmas Day, and what happened to them after that. It’s a summary graphic. The full tables on Christmas Day for the past 20 years are in this PDF: Premier League tables at Christmas, past 20 years. (Note that the tables are taken the from the date of the final game before Christmas each year and contain the result of those games and the table as it then stood on Christmas Day. Go on, treat yourself, it’s a free festive trip down memory lane). The only teams with single-digit points by Christmas in the PL era have all been relegated: Sheffield Wednesday (6 points by Christmas 1999, down in 2000); Sunderland (5 points by Christmas 2005); Derby (7 points by Christmas 2007); and Reading (9 points by Christmas 2012). Before we consider what chance Leicester have of staying at the top, look at the chart below. 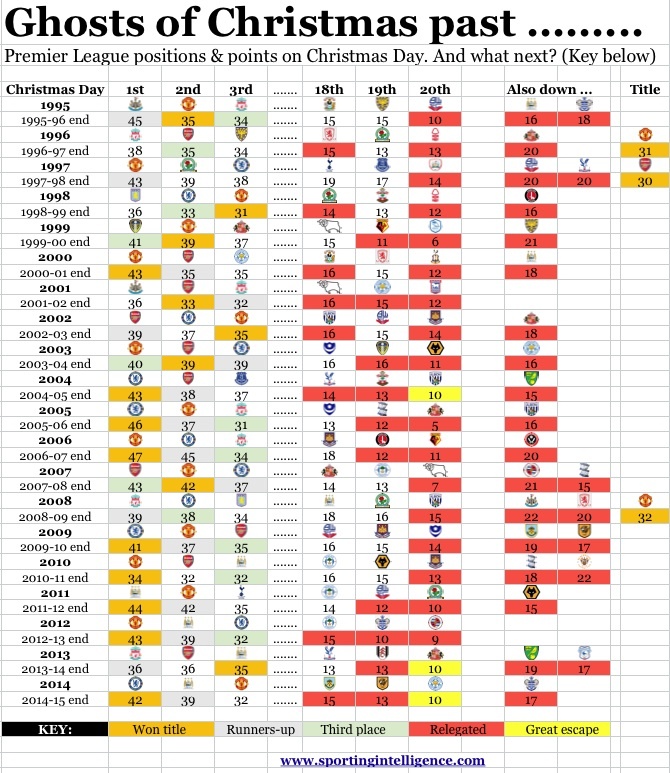 To ‘read’ it by season then scan from left to right to see the top three and bottom three at Christmas (denoted by club badges) and below each badge the points those clubs had on Christmas morning. So for example in 1995-96, Newcastle were top at Christmas with 45 points, Manchester United were second with 35 points and Liverpool were third with 34 points. Coventry were 18th with 15 points, Wimbledon were 19th with 15 points and Bolton were 20th with 10 points. The colour coding on the points tells you the end-of-season fate of the clubs. Gold means title winners (Man Utd); silver means runners-up (Newcastle) and green means third place (Liverpool) while red means relegated (Bolton). Coventry and Wimbledon got out of trouble (no colour code) but instead Manchester City and QPR, with 16 and 18 points at Christmas, also went down with Bolton. Alternatively you can ‘read’ the graph downwards, and see what happened to the clubs in those positions. Newcastle were top in 1995 but failed to win the title. Liverpool were top a year later and failed to hold it. United were top in 1997 but Arsenal stormed to the title from 13 points off the Christmas pace to top them. And so on. Similarly, look down the clubs in 20th place at Christmas and only three ‘Great Escape’ clubs stick out. Clubs in 19th on Christmas Day are likelier to survive than those in 20th, and clubs in 18th a little likelier still to survive than those in 19th. So what about Leicester’s chances of staying at the top of the table? In five of the past six seasons, the team at the top on Christmas Day has won the title, and the only club that didn’t (Liverpool in 2013) finished second at the campaign’s close. Altogether, nine of the 20 Christmas leaders in the past two decades have gone on to win the title (45 per cent). Another five Christmas leaders (25 per cent) have finished as runners-up, and while three Christmas leaders (15 per cent) have finished third. That leaves just three Christmas leaders of 20 (or 15 per cent) who have ended the season outside the top three. The last time that happened was in 2001-02 when Newcastle led at Christmas but finished fourth. Before that, Villa in 1998-99 were top at Christmas and finished sixth, and before that Liverpool were top at Christmas 1996 but finished fourth. Purely statistically, that gives Leicester a slightly less than evens chance of staying top, a 70 per cent chance of being in the top two, an 85 per cent chance of the podium, and a 95 per cent chance of Champions League football next season, ie: a top-four finish. Will it happen? We don’t know, obviously, which is part of the beauty of the game, and part of what makes this season especially refreshing. We at Sportingintelligence do not, by and large, support the ‘big’ clubs, not through prejudice but by accident of birth. My own team for too many decades it’s comfortable to remember is Watford. Site editor Nick Harris supports Southampton. Other regular contributors are respectively afflicted by Villa, Wrexham, Everton, Bournemouth, Nottingham Forest, Crystal Palace and AFC Wimbledon. Roger Pielke Jr supports Arsenal, from Colorado, Alex Miller supports Liverpool from the south coast, and there’s even been known to be room for those from the north London divide. But as far as I’m aware, we don’t have a regular Leicester fan contributor but I can tell you that so far, those Foxes have been the best value for money this season. By that, I mean when you consider their wage bill (for the whole club, not merely the players) and calculate how much they have spent so far per Premier League point, they are the best value. We don’t have any official confirmation of club salaries for this current campaign yet and in any case the wage bills will change as players sign or leave in January, and earn or forfeit bonuses due to performance. 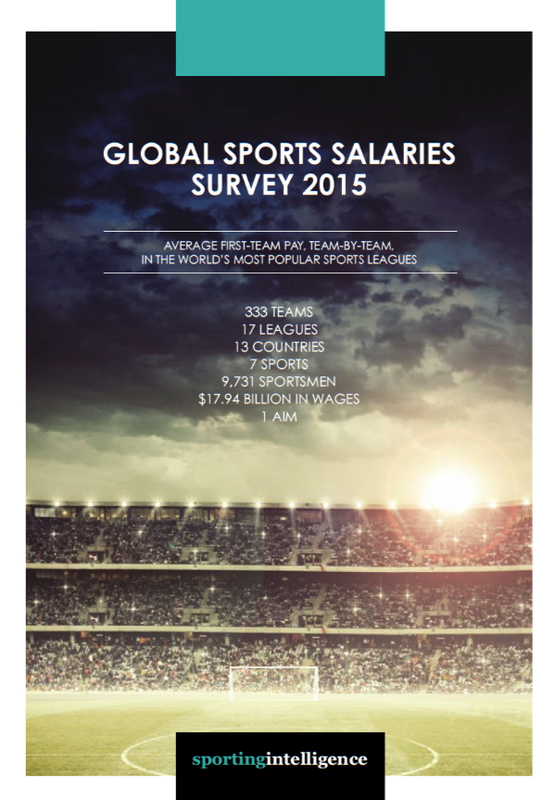 But we can make a very reasonable guestimate of the total salaries per club, based on recent financial records, and the table below is produced on that basis. To provide one example, of Leicester, we think their wage bill this season will be in the region of £55m or thereabouts, certainly among the lowest in the division. On a pro rata basis of 17 PL games played so far, of 38, we are calculating a total wage spend so far of around £24.6m. And with 38 points for that spend so far, we reckon Leicester’s total wage spend per point so far this season is not a million miles away from £647,507 per point – the best value in the division. At the other end of the scale, Chelsea’s wage bill for the season will be in the region of £200m, or around £89.5m for the first 17 games (yes, pro rata per league game). And with 18 points, that works out at £4,970,760 per point. Which is more than anyone. Villa are providing second worst value at £4.47m per point. Providing second-best value are Watford. Which is a warming winter thought to those of us of the Hornet persuasion. Among the ‘big’ clubs, namely the pair from Manchester, and Chelsea, and Arsenal, and Liverpool, Arsenal are providing the best value per point for their wage bill this season. They also have the longest-serving manager in the division by a country mile in Arsene Wenger. 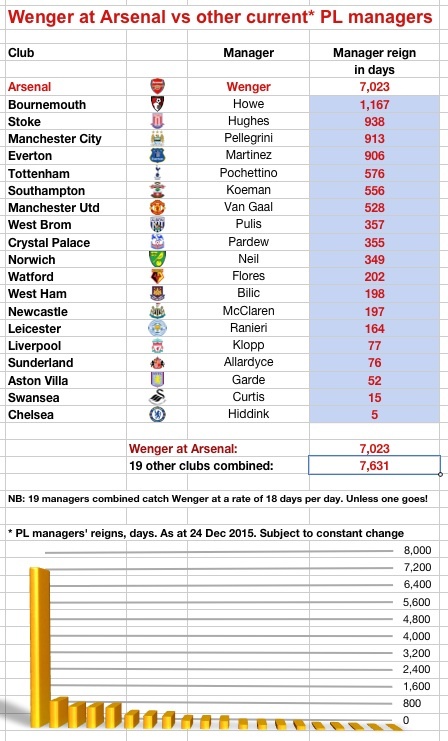 With the departure of Jose Mourinho from Chelsea, Wenger’s time in charge at Arsenal almost topped the collective time in charge of the other 19 current managers in the PL combined. Here is how the time spans stack up as of today (Christmas Eve 2015). Things do change fast though. With that, have a very merry Christmas.